Will the G20 Water Down Fossil Fuel Subsidies? A recent leaked document that has been obtained by ClimateWire indicates that the G20 will water down its previous committment last year to phase out fossil fuel subsidies by making them “voluntary” and “member specific”. Check out this preamble to the G20 in Toronto and look for the highlighed portions. Below is Greenpeace’s press release about this document. International/Toronto-23 June 2010–As BP’s oil continues to gush into the Gulf of Mexico, G20 heads of state, due to meet in Toronto this weekend, are planning to dilute last year’s commitment to phase out subsidies to Big Oil and Big Coal, according a copy of the draft statement seen by the environmental groups, Greenpeace and Oil Change International. Last year in Pittsburgh, G20 leaders agreed, “To phase out and rationalize over the medium term inefficient fossil fuel subsidies while providing targeted support for the poorest” (1). However, this year’s draft statement (2) sees the commitment watered down with the inclusion of “voluntary, member-specific approaches,” to ending fossil fuel subsidies. “Subsidising the likes of BP, oil disasters and climate change is nothing short of insanity. The Gulf oil disaster has focused minds world wide on the need to end our oil addiction and begin an energy revolution. The urgent need to shift massive resources into energy efficiency and renewable energy sources. G20 leaders need to put their money where their mouths are and keep their promise to cut fossil fuel subsidies,” said Kumi Naidoo, Greenpeace International Executive Director, who will be an observer at both the G8 and G20 Summits. The developed world currently gives around $100bn a year to the fossil fuel industry in subsidies – one of the reasons ExxonMobil didn’t have to pay any US tax last year (1). Meanwhile Governments are baulking at coming up with the $140 billion a year in finance needed by the world’s poorest countries adapt to climate change and move to a clean energy economy. Both groups called for the G20 Leaders to redouble their commitment to end fossil fuel subsidies. Rather than dilute their promise from last year the G20 must take heed of the BP Deepwater oil disaster and move the world rapidly away from its addiction to fossil fuels. I have three more videos from the US Climate Action Network(US-CAN), and CAN international, and the Global Campaign for Climate Action on what has happened in the first week of climate negotiations in Bonn, what happened today, and what to expect in the second week. Climate finance is a big issue in Bonn, as its important for developed countries under the Copenhagen Accord to provide assistance to developing countries to adapt from climate change and mitigate their own emissions. Finance is a key cornerstone to a global deal, but as Steven Guilbeault of Equiterre explains in this video, its becoming a sticking point in Bonn. Here is a good report that talks about how to ensure climate finance is new and additional. This one is by the Union of Concerned Scientists Alden Meyer on today’s negotiations, the reality gap between emissions reduction promises made at COP-15 & the science needed to get us back on track in Bonn, what you can do to help shape the conversations & what to expect tomorrow. Bonn, Germany – June will be a watershed month for global efforts towards a low-carbon and climate resilient future, says WWF. UN climate talks in Bonn starting today and the G8 and G20 summits later this month can create huge momentum towards a number of breakthroughs needed for a global climate agreement that would speed up the race to the low-carbon future. “June is a turning point for climate politics after a period of confusion and soul-searching since Copenhagen,” said Kathrin Gutmann, Head of Climate Policy, WWF Global Climate Initiative. 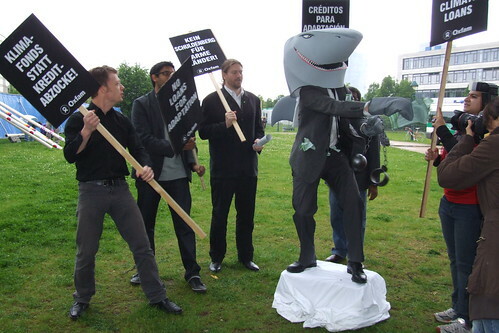 In WWF’s view, negotiators in Bonn can push some important debates close to conclusion, e.g. on forest protection driven by carbon finance – the so called REDD+ agenda – and on creative financing for low-carbon action and climate resilience in developing countries. “We are at the verge of agreeing to stop deforestation and to gear up for dealing with a changing climate through adaptation”, says Gutmann. WWF advocates a similar step by step approach to closing the gigatonne gap, a massive mismatch of emission reduction levels pledged by countries in the Copenhagen Accord and the levels that are actually needed to secure a climate resilient future. “Countries will win the gigatonne challenge if they speed up the low-carbon transformation of their economies, close the loopholes that undermine their national action plans, and work together to extend their transformative efforts to new sources of pollution that haven’t been regulated so far”, says Gutmann. A fiesta in Mexico to blow away the post-Copenhagen blues will also depend on climate finance, putting the upcoming G8 and G20 summits in Canada into the spotlight. Heads of States there are scheduled to identify new sources of finance like taxes on financial transactions or levies on emissions from unregulated sectors like shipping and aviation, and to discuss the switching of subsidies from polluting fossil fuels to innovative energy technologies – in order to marry their economic and environmental agendas and add momentum to the race towards the low-carbon future. “Using G8 and G20 to mobilize funds for clean development and the Bonn talks to sort out building blocks for a climate agreement will give the international community the important atmosphere of trust that got lost during the Danish disaster last December”, says Gutmann. – WWF will run the Climate Deal Oracle throughout the Bonn conference, a poll asking negotiators and observers when we should get and when we will get a global climate agreement. WWF will unveil the poll and an installation during a photo opportunity for press on Monday 31 May at 09.00 AM outside the Maritim Hotel (UNFCCC meeting venue), Bonn. – Together with partner NGOs, WWF will close the Bonn climate talks with a visual action on 11 June outside the Maritim Hotel, involving a giant dice and world leaders gambling with the climate. Exact time to be announced closer to the event. – WWF hosts an official side-event to promote the concept of Zero Carbon Action Plans (ZCAPs), on the basis of a master-plan for decarbonizing the German economy, called Blueprint Germany. The event takes place at Room Rail, Ministry of Transport, 1 June, 13:00-14:30. WWF invites press to attend briefings on this topic from 11:00 to 12:00 and 15:00 to 16:00 the same day. Exact venue to be announced. – WWF will launch various papers throughout the Bonn conference, e.g. on adaptation (2 June) and on measuring and verifying climate action (7 June). Details to follow. With climate talks restarting in Bonn, Germany after the contentious finish in Copenhagen last winter, I want to plug the “Adopt a Negotiator” blog where young people follow climate negotiators from their country to these talks, and blog about what they see and see. It’s real helpful for the rest of us. Joshua Wise is the American blogger for this, and you can follow him here. His latest post looks at the Major Economies Forum on climate the US will be hosting, and the finance issues that countries face moving forward, based on what came out of the Copenhagen Accord.